Rhipsalis (Rhipsalis spp. ): growing, planting, caring. Scientific name : Rhipsalis spp. Full description for Rhipsalis spp. not yet available. Rhipsalis is a kind of small shrub measuring 15 cm to 1.5 m, which form succulent stems, green, without thorns, very ramified, erect or pendulous. The flowering is discrete, with slightly fragrant hanging bells, and takes place twice a year, in winter and early spring. The flowers turn into small white spherical bays. Plant in a pot, in a light, porous and well-drained culture substrate to prevent the water from stagnating at the roots. In pots inside, place it in front of the windows so that it stays beautiful even in winter, but in summer, shelter them from the burning sun ... In winter, they will prefer a cool room. In summer, do not hesitate to take them out if the conditions are favorable. 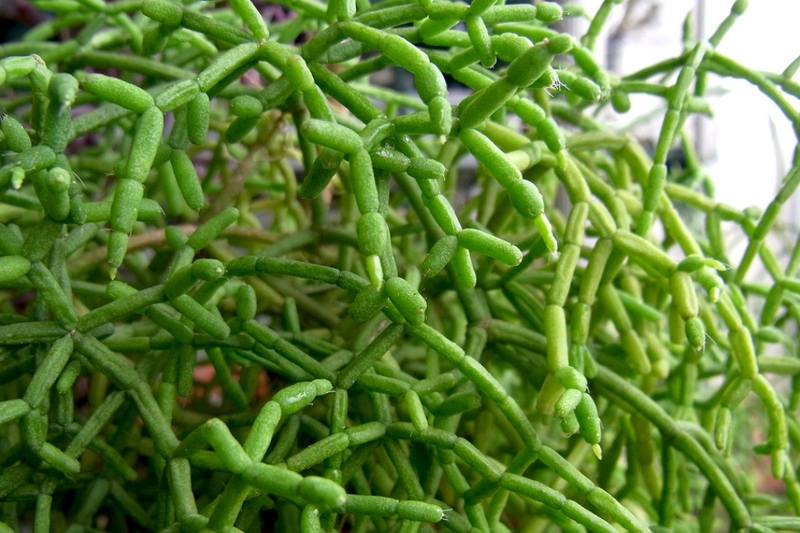 Rhipsalis tolerate infrequent watering, and hate stagnant water. On the other hand, they like to be misted from time to time. The watering rate varies with the season, as your plant "evaporates" more when it receives a lot of light. This rhythm varies from twice a week to twice a month. How to water well? You can use tap water or reclaimed water. Sprinkle slowly in winter, and if you see water in the cup, empty it. In summer water more copiously, without leaving water stagnating in the cup. Bring it inside well before the first cool nights, in a room not too heated so that it "feels" that it is winter: 7 to 10 ° C at night without artificial light! You should stop all watering until spring.